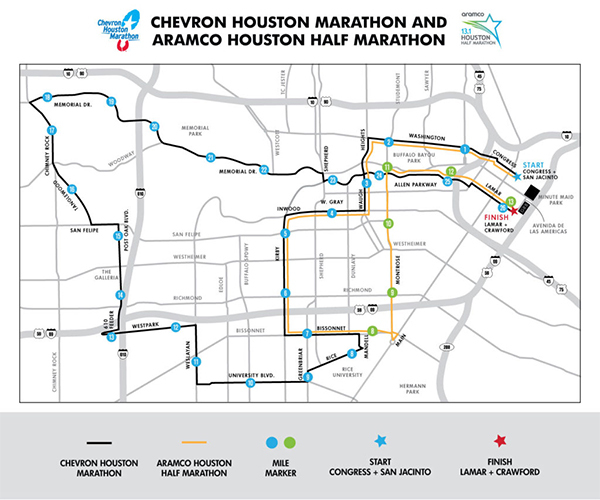 HOUSTON, Texas (KTRK) -- The Chevron Houston Marathon and the Aramco Half Marathon takes place this Sunday, and if you are planning to get behind the wheel, make sure your route is not blocked off. Dozens of major streets around the Houston area will be blocked for the full or half marathons. Streets close at 6 a.m., and re-open gradually as runners finish the race. Most streets are expected to be open by 2 p.m.
Don't forget, if you are looking for a fast way to get around town, use the freeway system rather than surface streets.